Beer. Cider. Wine. Whiskey. Gin. These are just some of the huge numbers of products stocked in an off-licence, and keeping track of inventory can be particularly daunting. It’s vital though, as you have to know all about your best-sellers, as well as under-performing products, in order to tailor the best business strategy. That’s why we’ve created an off-licence EPOS with the power to help you understand your business, from each and every direction. Every off-licence owner knows that the real work starts when the store finally closes, with heaps of admin just waiting to be waded through. There’s inventory management, staff rotas, stock checking – the list just seems to go on and on forever. With AccuPOS though, you can complete many of these vital tasks from the comfort of your own home. 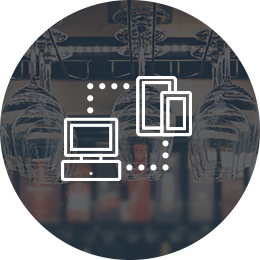 Simply log into the system remotely and, voilà, you’ll have your entire business at your fingertips. That should make admin that little bit more comfortable. If you ever thought about the amount of time you take every week entering your accounts by hand, you’d be stunned. What’s more, just think of all the other useful things you could be doing in that time. Well, get ready to supercharge your productivity, as our EPOS will send all your sales numbers to your accounting software automatically, eradicating human error and providing the perfect picture of your business. The result? You can order more of that popular red, or perhaps get rid of the cheap whiskey that hasn’t sold a bottle. 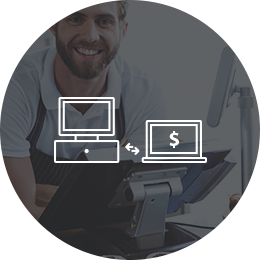 Endorsed by both QuickBooks and Sage, our accounting integration is certainly something you can trust. Now, pass the bottle – it’s time to celebrate. Why should any EPOS company expect an off-licence to adapt to their way of doing things? At AccuPOS, we certainly don’t. That’s why we’ve created the most flexible EPOS around, able to adapt to any requirements. 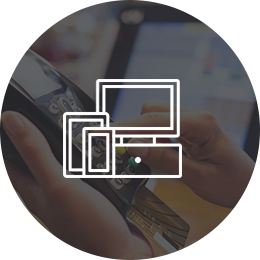 We let you keep your own hardware; we will accommodate as many screens as you like; and we’ll always work to solve any challenges you have, until your EPOS fits your business, not the other way around. Perhaps this is why so many trust AccuPOS with their EPOS, and why so many of our customers are excelling?